Hi friends! 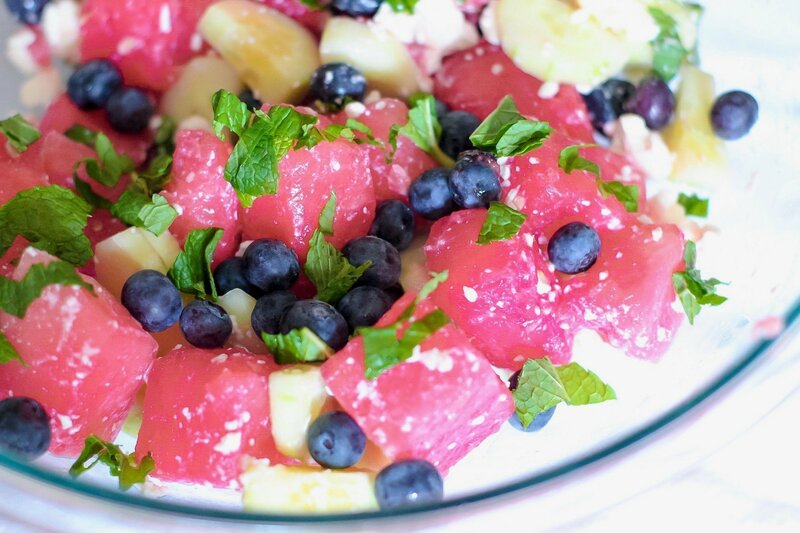 I have a great post today with a recipe for a refreshing summer salad everyone is sure to love. It has tons of flavor, and no two bites are the same. It’s both delicious and surprising at the same time. This Summer Salad recipe is actually a variation of the one my other used to make for us growing up. 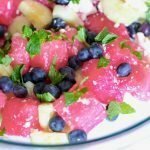 Usually served next to a tender, juicy grilled chicken breast, this fruit summer salad was one we looked forward to each summer. Honestly, you can make this salad whenever you like – but it’s best in summer because of how refreshing it is. With fresh, organic lime juice squeezed over the top just before serving, this Summer Salad will have your mouth watering and wanting more. And with summer right around the corner, my husband and I are making attempts to eat healthier. His main goal is to lose weight and feel more confident, and my goal is to pack in as many fruits and veggies into my diet as I can. But, I’m not going to lie – we both like carbs and being lazy on the weekends ;). It can be a struggle! Maybe it’s your spouse that you’re trying to get to eat healthier – maybe it’s you who’s trying to find a way to enjoy foods that you know are good for you. Either way, this recipe solves all of your problems! Eliminate Sugary Drinks And Juices – Opt For Water Instead! Before he heads off to work each morning, I slip one of these vitamins and a glass of water to my husband. It can be taken on an empty stomach, so he has no excuse not to take it! 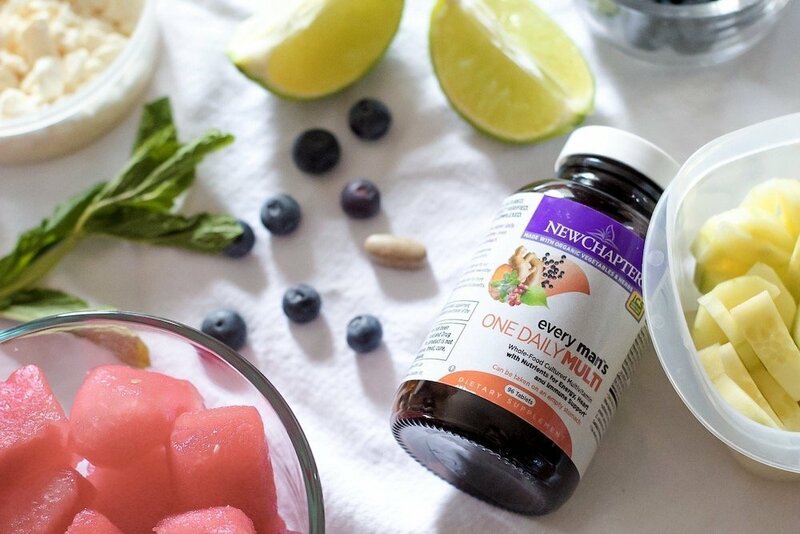 New Chapter’s Every Man’s One Daily multivitamin is one that my husband has been taking for quite some time now. 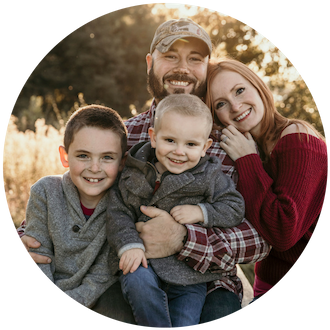 He loves that he only needs one small whole-food tablet per day to help with his energy, heart, and to help provide immune support. They’re also organic and whole-food fermented for easier digestion and absorption. 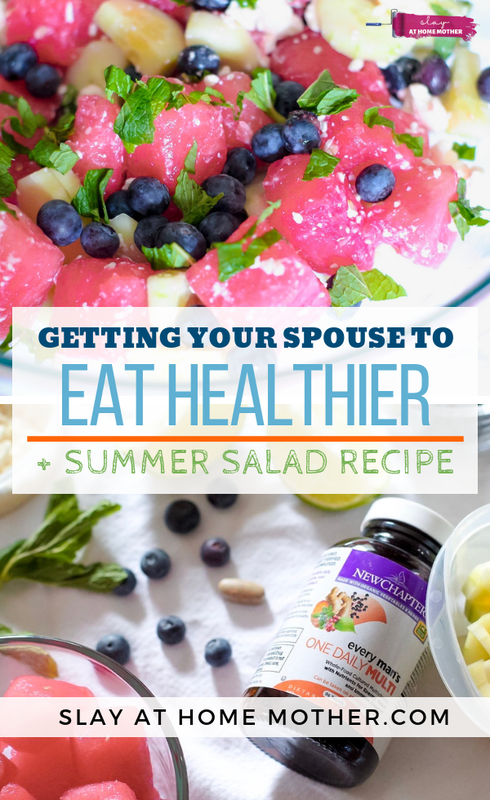 Along with his multivitamin supplement, I make this flavorful summer salad recipe for him so he can eat healthier and reach his goal for the summer! 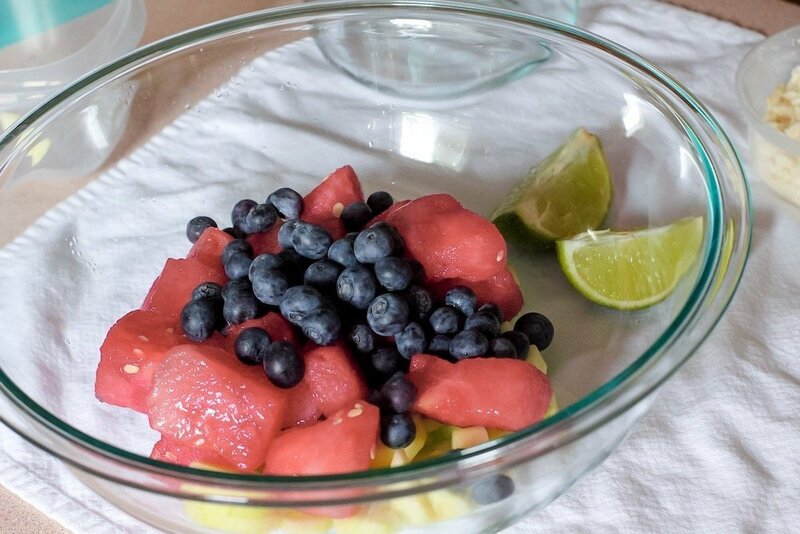 In a large glass bowl, combine the fruits (watermelon, blueberries, and sliced up English cucumber). Blueberries contain a high number of antioxidants, protect your body from free radicals, and are both low in calories and high in nutrients! Watermelon helps you rehydrate, and is a great source of vitamin C and vitamin A.
Cucumbers, also a fruit (not a vegetable), contain water and may even help with weight loss. For this recipe, I chose to use an English cucumber (also known as a hothouse cucumber) because they are less bitter than regular cucumbers, and tend to be on the sweeter side. So if you’re trying to convince your spouse to eat healthier, I say go sweeter when you can! Feta cheese is great for this recipe because it is crumbly, light, and while it contains a lot of nutrients like iron, folate, magnesium, and vitamins A and K, it is lower in fat and calories than parmesan or cheddar cheeses. *If you or your spouse is pregnant, refrain from eating feta cheese as it is unpasteurized. 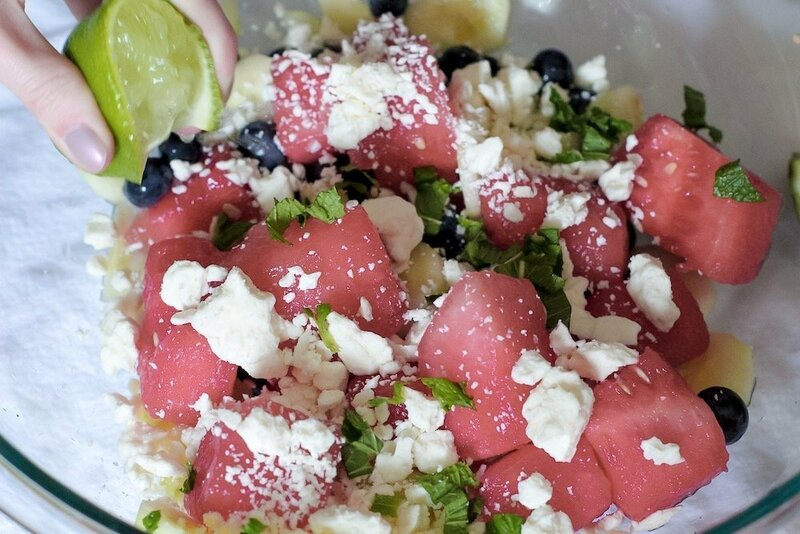 While eating cheese and fruit may seem boring, you can jazz just about any dish up with the right amount of lime and mint for a refreshing zing of taste and flavor! That’s what I’ve done with this summer salad recipe, but if you’re feeling stuck or bored with healthy meals, sometimes just one or two quick changes is all you really need. Plus, limes are high in potassium, which is great for managing your blood pressure and nerve function. Mint can help with indigestion and gas, and it makes everything taste cool and refreshing! Squeeze some fresh, organic lime juice on top of the salad – this really ties in all of the flavors! Stir all of your ingredients together just before serving, and enjoy! This salad, packed with nutritious fruits and zingy zests, along with a great multivitamin like Every Man’s One Daily, is a great way to get your spouse to eat healthy and enjoy it! 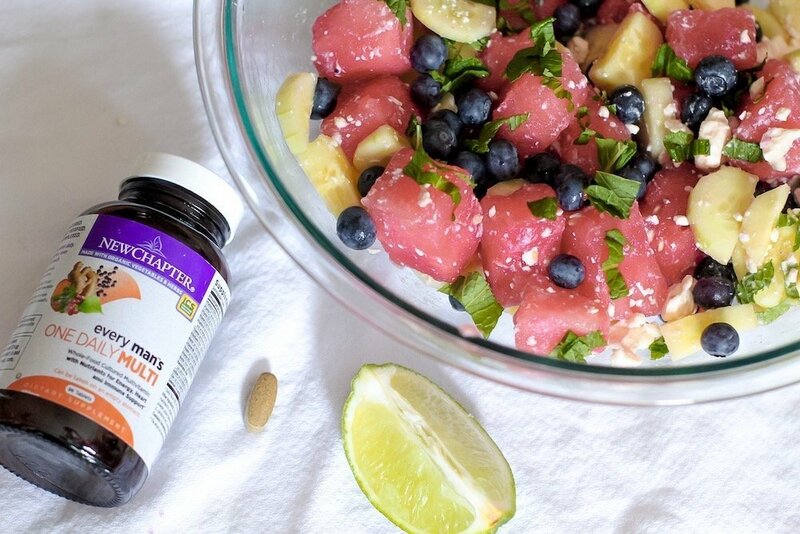 Combine fruits and veggies in a large bowl (watermelon, blueberries, and cucumber). Chop mint leaves, and cut lime into quarters. Add in feta cheese, chopped mint leaves. Squeeze juice from one lime into bowl with other ingredients. 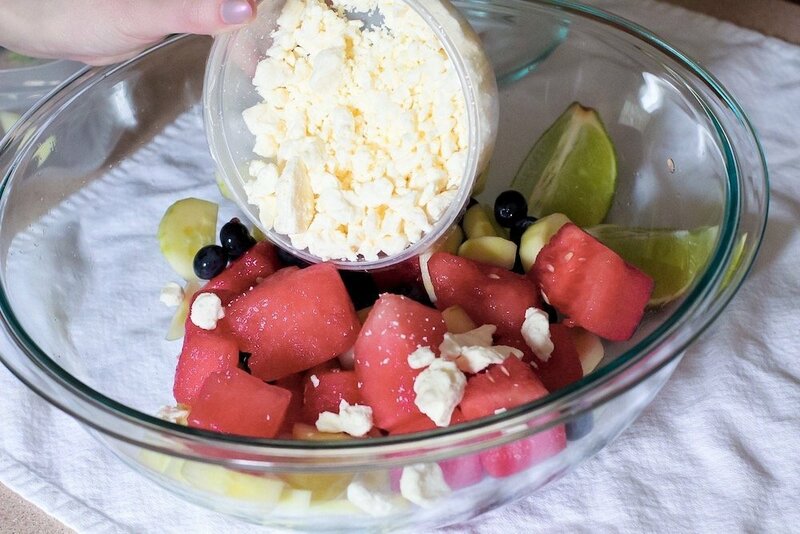 Mix together with slotted spoon, serve immediately. Along with taking a fermented multivitamin and eating healthier, drinking plenty of water is super important and can help with digestion, blood pressure, and dissolving minerals and nutrients so the body can better access them. Try substituting your spouse’s soda, energy drinks, and juices for a tall glass of ice water to go with meals. Just an idea, but if you tend to think water tastes too plain, try adding some lemon and cucumber slices to your water for a little natural flavoring! Summer heat means you are more susceptible to heat exhaustion and fainting. Make sure your family doesn’t skip breakfast, especially before packing up to visit the beach or the lake and spending hours in the sun. Try making breakfast together in the morning – whether it’s waffles and cut up strawberries, or sunny-side-up eggs with a side of oatmeal, you’re more likely to eat breakfast when you eat together. 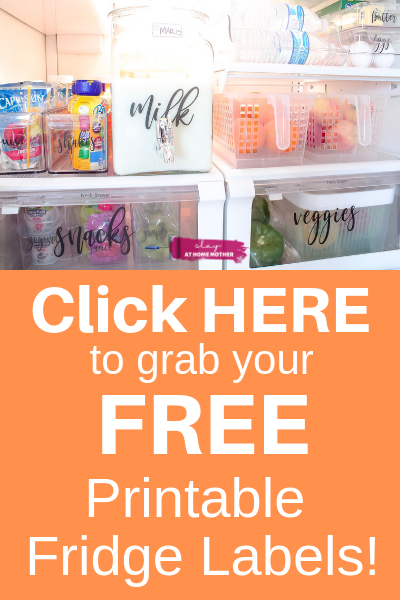 I hope you enjoyed this post, and I hope it’s helped you find ways you can incorporate healthy, good-for-you multivitamins and foods to fit your lifestyle! Tell me some changes you’d like to make for this summer season in the comments below! I need to try this recipe. I struggle so much to find a healthy recipe my husband will enjoy too. What a gorgeous, I love it!! My husband will generally eat anything I make if it is healthy. He likes variety. It is keeping him from going rogue when I am not around.